The staff and members of the My Place Teen Center would like to recognize and congratulate Eldad for being awarded the Teen Member Spotlight! Eldad is 14 years old and a freshman at Westbrook High School. He lives with his mother, father, two sisters, and his twin brother. He has attended MPTC since his big move to Westbrook in November 2015. Before living in Westbrook, Eldad lived in Paris for nine years, but originally was born in Africa. He speaks two fluent languages – French and English. Eldad loves coming to My Place Teen Center. His favorite things about the Center are the daily programs and activities that are offered, being able to hang out with his friends after school, and having Movie Nights here at MPTC! He also enjoys the field trips; this past year he went to Kiwanis Beach, Sebago Lake, Happy Wheels, and to a Seadogs game. Eldad is currently on our High School Youth Leadership Council (YLC) and is flourishing. 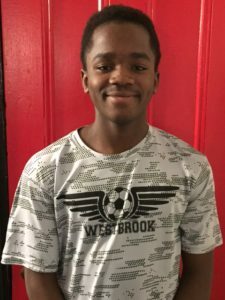 He is learning team building skills, leadership skills, completing civic engagement activities, and is a good role model for other teens at the Center and even those around him while not at MPTC. We are very happy to have Eldad come on a regular basis to MPTC. He is a dedicated and hard worker, a good student, a team player, and very passionate about all he does. To that end, Eldad loves to play sports. He played for the high school team this past fall and is also doing indoor travel soccer this winter. He is interested in basketball as the shooting guard. 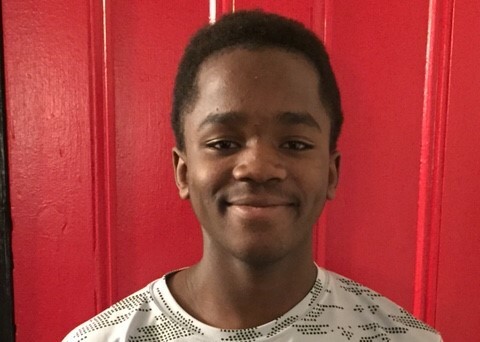 He wants to play soccer and basketball while in college and become a professional player. His favorite colors are black and white, just like a soccer ball! He listens to rap songs and his favorite movie is HOME ALONE. Eldad wants to make a lot of money when he grows up so he can help out his family. He wants to help all of his family members move to the United States. He currently has a brother, sister, aunt and uncle in Canada, and one brother, with his family, in Australia. If Eldad had to describe himself in one word, he would use different. If MPTC staff had to describe him in one word, we would choose genuine. Keep up the amazing work, Eldad. We are very proud of you and all you have accomplished!